Climate Models Fail at Antarctic Warming Predictions | Watts Up With That? Note: this is a NASA illustration for the purpose of this story, it is not from the peer reviewed paper. There is a a peer-reviewed study in the April 5th issue of the journal Geophysical Research Letters. It is by Andrew Monaghan of the National Center for Atmospheric Research in Boulder, CO. “This is a really important exercise for these climate models,” he said. “The research clearly shows that you can actually slow down sea-level rise when you increase temperatures over Antarctica because snowfall increases, but warmer temperatures also have the potential to speed up sea-level rise due to enhanced melting along the edges of Antarctica,” Monaghan said.The gap between prediction and reality seemed to be caused by the models overestimating the amount of water vapor in the Antarctic atmosphere. The cold air over the southernmost continent handles moisture differently than the atmosphere over warmer regions. But they fail to recognize that there may be a volcanic heat source as well such as the volcanic mountain range comprising much of the Antarctic Peninsula, including volcanoes such as the Seal Nunataks around the Larsen Ice shelf and under the Ross Ice Shelf here. Antarctica has no statistically significant warming for the last three decades. May 7, 2008 in Uncategorized. Where’s Deception Island on that Vulcanism map? I’ve been there it’s awesome. Ah crap, nevermind, I missed it the first time. Now I see it. As a sceptic, I would still say that stories like this are very dubious, even if they confirm our beliefs. The claim that Antarctica warming had been measured at 0.2 deg C in the past 100 years sets my BS antenna quivering. How are we supposed to take such a measurement seriously when no location in Antarctica has temperature records going back more than 50 years, and vast tracts of the continent have no records at all? Personally, I think that any warming (or cooling) claims measured in tenths of a degree over a century, from surface stations anywhere in the world, should be regarded very sceptically. The rest of the globe clearly excludes the SH, which has had no significant warming over the 30 year satellite era and there was no measurement over most of the SH hemisphere prior to that period for rather obvious reasons (It’s mostly ocean). Otherwise, the Antarctic Peninsula isn’t a peninsula. It’s an island. And Antarctica looks more like an archipeligo than a continent. So in terms of vulcanism, it may well be more like Indonesia than Australia. The Antarctica picture that you have shown has been updated by NASA here, where they also explain the reason for the update. The study confirms what we’ve long suspected…the models have grossly exaggerated future events. The model predictions were about 3.5 times higher than what has been actually observed. And I agree with braddles. A temperature increase of 0.2°C for 100 years is for all practical purposes a flat trend. Now compare that with the CO2 increase. Any correlation? The models did, however, correctly capture the increases in snowfall over Antarctica in the late 20th century, followed by a decrease in the last decade. I want to see where the models predicted a decrease in temperature over the last decade. And when was Andrew Monaghan of the National Center for Atmospheric Research in Boulder, Co going to announce this cooling of Antarctica predicted by climate models? It seems to me that he waited all through the rise of Gorebal warming hysteria without saying a discouraging word. I have to float my stick with braddles. This guy’s a liar. You can tell because his lips are moving. But wait. I thought the braintrust at Realclimate said Antarctica was going just as predicted…? NASA claims to have updated the image, Temperature Trends, which shows far less cooling. Given NASA’s lack of transparency when adjusting time series data, not sure what to think of it. ‘Scuse the de-lurking. While I’ve enjoyed the varied comments here, the whole AGW debate seems to be more generally driven by attitudes rather than science. I had some problems over at tamino.wordpress.com. – Tamino claimed that s/he could legitimately start his/her warming series from 1975 because objective mathematical analysis indicated that was the the turning point. So I asked, if Tamino was so good at picking turning points, when was the next one coming? Or would the seas boil in a few thousand years? – Tamino also presented and defended an English temperate series in which smoothed data showed a substantial recent peak. I look at the graphs, and concluded that the peak was not justified by averaging, and so the “smoothing” must have included a trend element. So I asked whether the “smoothing” included a trend. Neither question made it through moderation. Is that the standard for debate in this part of the blogosphere? REPLY: Yep, SOP. If you really want to test moderation, try asking when there will be a response to McIntyres criticisms of Tamino’s defense of the MBH 98 tree ring study that evolved the hockey stick. Does anyone have an “input deck” to one of these climate modeling codes that you could share with the rest of us? I know this question assumes that these guys actually still do the calculations rather than pulling answers from parts unnamed (a dubious assumption). If these codes are anything like the radiation transport codes that I work with, then we will likely need an interpreter to let us know what the gibberish in the input means. If we could all look at the input and the assumption of these calculations that ALWAYS get the wrong answers, then maybe we could help these modelers improve on their predictions. I doubt that this would help, but maybe it is worth a shot. braddles, I agree. I’ve become a skeptic of everything lately and especially in the case of Antarctica where there simply isn’t enough data to make firm conclusions. Many AGW proponents say that the cooling of the Antartic was forecasted in the GCMs scenarios. Generally, it seems the models over-predict warming by a factor of 2 or 3. Primarily, this results from the assumptions that increased GHGs lead to increased temperature which leads to increased water vapour which leads to further warming etc. The increased water vapour assumption does not appear to hold true in Antarctica, the tropics, and the tropopause region of the atmosphere. The science is still out on the lower atmosphere of middle latitudes and the Arctic. If the models are indeed out by a factor of 2, such that warming is only 1.5C per doubling of GHGs, then global warming will be nothing to worry about at all. Just get it right you modelers and base your model assumptions on the impacts which actually happen versus those that are theorized. Bill, they also seem overestimate cooling by about half. Makes room for the extra GHG and feedbacks warming. Don’t remember where, probably CA, but I remeber seeing example of how most models overshoot cooling after volcanoes and the subsequent warming as the added aerosols dispate and GHGs don’t. ‘Dissipates’ is not a good word, but I don’t know what is. Dyson Freeman has repeatedly stated that there’s an inherent contradiction in the claims that CO2’s marginal effect in humid air could result in such large water vapor (WV) feedbacks when its effects in dry air would prove the most pronounced. The NASA/GISS Dept. of Creative Data reinforces his point by in turn fudging the WV effects in Antarctica (never mind the big interpolations…). What really gets me about this report are the continued claims of the effects of the ozone hole on winds & air temperature. That’s a lynch pin that holds up their entire message against CO2 complacency. This paper cites the ozone hole as holding temperatures down, but the ozone hole didn’t appear until the mid-1980’s, so their claims don’t hold until then, which puts their ozone hole statement completely into question. I’m still at a loss, honestly, to understand how more UV entering the atmosphere can change pressure differentials in the atmosphere (as is claimed by the statement that the ozone hole is leading to increased winds). UV doesn’t translate to IR, and IR is the only thing I can fathom would ever lead to changes in air pressure. The ozone hole is a regional difference in oxygen chemistry, not a thinner patch of air with lower air pressure. That is, the amount of total net atmosphere over the continent is the same, whether there’s O2 or O3 in the ozone layer. Nor have I heard any claims that the ozone layer in any way is involved in releasing or containing radiative heat. Someone correct me if I’m wrong. So how is it that the ozone hole can have a role in air pressure and wind? Again, the ozone hole didn’t appear until the mid-1980’s, but they claim that the temperature trend is 50 – 100 years and then skip onward as though the ozone hole was involved in holding temperatures down for the entire duration. Looks like a big discontinuity in reason to me. If the climate models were this wrong, then what else did they get wrong? How many more warming-only hypothesis reversals do we need to endure before someone in the AGW camp finally has the temerity to toss off the entire mess? Hmmm let me see if I remember correctly if the water warms then it evaporates faster causing the remaining water to cool. The evaporated water is water vapor. The water vapor then rises due to being warmer than the cooled surface of the water. Let me think yep the water vapor rises into cooler atmosphere and condenses causing clouds. Now if I remember clouds look white when exposed to sunlight. and that would be the top of the clouds and the part of the cloud that isn’t exposed looks dark. If that is true the tops of the clouds would reflect at least the visual spectrum of the suns energy away from earth and the dark lower would absorb the heat radiated from the surface warming the vapor more making it to rise further into cooler areas perhaps causing rain. Rain evaporates partially falling to earth and cools the near surface atmosphere and the surface of the earth causing less water vapor. Less water vapor the clouds thin and clear allowing more sun to reach the surface causing heat and then water evaporates causing more water vapor. and we start all over again. It seems that water vapor might be the controlling factor when considered along with the forcing of the sun that keeps the other GHG in check… This is just the thoughts of a non scientists remembering some of the earth science taught more than 40 years ago in high school. I think it is time to review what we really know about water vapor and how it really effects the temperature. It seems that with the action of the forcing of the sun it might either cause retention of heat or the radiative loss of heat. New & improved constantly shifting rationale are the bestest and surestest signs of smart people realizing they effed up. I find it remarkable how the old warming-only figure was 0.7 degrC, pretty much matched to the current H-CRUT trend line, etc. Professional egos overly invested in stating a large risk (typically based on known unknowns, risk mgm’t for the neurotic) can be bad enough, but when their assumed knowned facts fall on the blade of empiricism, the shortcomings of expertise rear their head in very amusing ways. The scale seems ‘way off. It can’t be by year. By century, maybe? Please clarify. REPLY: Evan, what are your referring to? I’ve tried to post links to sunspot movement & spotless day trends on Andy Revkin’s “dot Earth” NYT blog after I got flamed for remarking on the forecast for SC#25. No go. My comments went into the bit bucket. Thrice now. There’s a trend here. They do let my posts through if I don’t put direct link-cites in my posts (other posters can) or commentaries on Al Gore. So long as I look enough like a know-nothing “denier” the posts go through. I’m good agitprop for the denizens. Nice trick, and the NYT doesn’t even have to pay me for my services. Gavin says climate models are always wrong. The question is if they are “useful”. Do these people have no shame? Is the “average” used based on a timeframe, and is the mean just the averaging of the daily high and low? Would that be the reason for the 1.5 degree differnce? Thanks, I really enjoy reading your site. REPLY: It is an excellent question, but requires some detailed explanations which I can’t do just at the moment due to other obligations. Perhaps our readers can chip in. The Realclimate thread on Antarctica is classic comedy GOLD! They had to pull references from articles written in the 1970s to support that one. Whenever I need a good laugh, I head over to RC. Never fails…. NOAA US temp data for April 2008 is in. and .30 degrees F colder than April 07. I have problem with the graphic at the head of this story. A few months ago I linked to Columbia University website (edgcm.columbia.edu/~mankoff/StationData/), affiliated with the GISS. There is a Google Earth implementation which supports the display of the GISS stations world wide including the West Antarctic Peninsular. Stations on the Western Slope of the West Antarctic Peninsular have plateaued while stations on the Eastern Slope have recently shown profound cooling. My question is what is the time period covered by the Antarctic graphic? It is showing warming on both the Western and Eastern Slopes of the West Antarctic Peninsular. 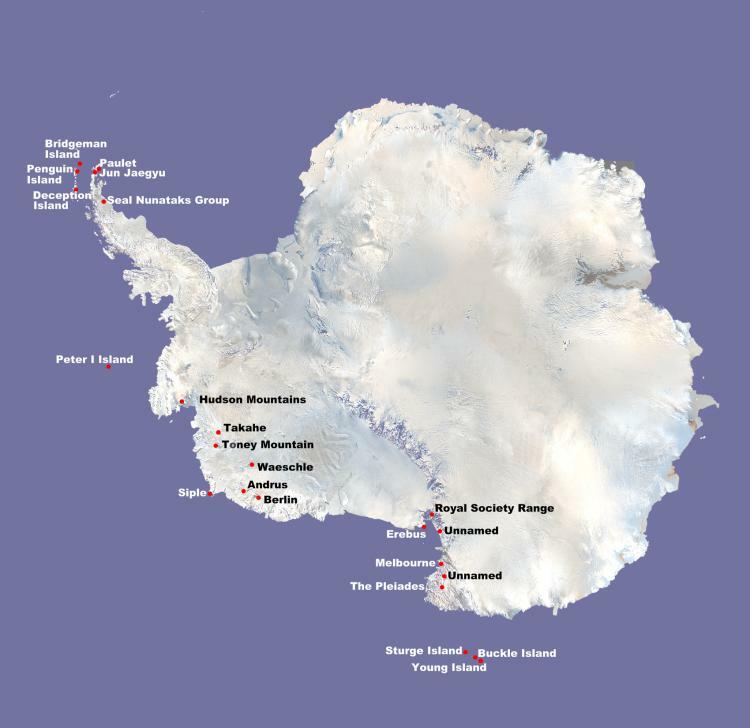 West Slope stations such as Rothera Point and Faraday have been at a temperature plateau. REPLY: The graphic is from NASA Earth Observatory, not GISS, it is satellite derived. GISS had nothing to do with it. The link you provide suggests Antarctica is warming. Strange how the sea ice around it is expanding and water in the sea is cooling. I wonder how NASA or anyone else can explain that. Essentially, as long as the heat transfer from the surface to the upper atmosphere increases in response to greater energy absorption by greenhouse gases, then there won’t be a temperature increase at the surface. Basically, it depends on how efficient heat is transferred up into the atmopshere via water vapor and convection. I think we’ve plateaued. In other words, even if CO2 doubles and absorbs more heat, the heat transfer mechanism is robust enough to carry it out of the atmosphere (to space). Negative feedback, if you will. That’s why the SH (with its oceans) have never seen a positive temperature trend and the NH has flatlined after some initial temperature rise in the mid-90’s. My opinion, of course. But, if I’m right, how can I get a piece Al’s Nobel Prize? Which basically means that every the largest temperature changes shown are within the estimated error bars. leebert, with reference to the “ozone hole”, I would suggest that it didn’t “appear” in the 1980’s, but was noticed. There is a big difference. There was a recent report that showed that the calculations which set off the whole scare now appear to be out by a factor of 10, so everything that went into producing the ban on CFCs is basically junk. Not least among the arguments to be raised in favour of this view is the point that most refrigerants would have been used in the NH, because most people live there. But there is only a minimally noticeable “hole” over the Arctic. Also CFCs are a fairly dense gas, so how do they get up into the high atmosphere and only at the centre of Antarctica? If they were so terrible, why wasn’t the ozone reducing everywhere? They produce massive amount of gases which can easily penetrate to the high atmosphere where they are trapped by the Polar vortex, as I believe it is called. Obviously too simple or otherwise the bone-domes would have thought of it. Correspondence to: Peter M. Cox1,2 Correspondence and requests for materials should be addressed to P.M.C. (Email: p.m.cox@exeter.ac.uk). Come to think of it why don’t we go back to using the dirtiest coal possible and that way we could both warm and unwarm the planet at the same time? That’s a 6 degree spread, which makes claims of 1/10 degree changes in temperature hard to swallow. If I had a voltmeter that had the same accuracy in volts, I sure as heck wouldn’t be using it to measure tenths of a volt. In fact it wouldn’t even be suitable to determine if your car charging system was working. Also, if they say 2-3 degrees, I believe that they are guessing and don’t really know. This is generally fascinating. With such an imbalance over such as short distance, something is going to have to dive. Consider the potential energy involved in the gradient. Notice how upset the guy gets over “deniers” using his study to show people that predictions of Antartic melting are all washed up-you know, the truth! El Gaspo to that. The text on the page Dell linked to agrees with what you got from the graph generator. Maybe they’ve changed the written summary since you looked, or maybe you looked someplace else? Minor point—the written summary says the decadal trend is 0.1 F while the calculator says 0.08 F. Yeah, yeah, I know, sig figs. Has anyone heard of volcanos in the ocean? I’ve been reading a site calledd -NOT BY FIRE BUT BY ICE-. It’s put out by Robert Felix. Mr Felix says there are many volcanos in the ocean a and near the atric and anartic as well .I went to ask .com and put in under water volcanos and one of the sites say there are at least 10,000 volcanos in the ocean.To me any ice melting would seem more reasonable to be caused by volcanos than exhaut from our cars that are many thousand miles away.Think about it .One of the coldest places in the world,artic and anartic ,are loosing ice because we are driving our cars and using fuel.I’ve been working at A ford dealershipfor almost 14 yearsBack in the mid 90’s when we ordered our new vehicle s they had to have the california emissions option on every vehicle we ordered .Today the standards are even more strict.My point is why are we spending all the extra money if were still the cause for the ice melt which we aren’t.Actually the ice is glaciers are growing ar record rate , except where the volcanos are. Well, I remember the before & after photos of the ozone hole, and of course it was a graphic w/out a ppm gradient sidebar, so I don’t know gradual or sudden the actual anomaly was like back then. FWIW, I did do a quick check & yes ozone does absorb some IR differentially from plain-old O2. Whether to accept it’s relevance to wind currents, and hence, air temperatures in the Antarctic, I don’t know. Methyl Bromide is also an ozone antagonist and is produced by the oceans in copious quantities & far more constantly than volcanoes, has a constant impact on ozone concentrations in the Antarctic, and less so in the Arctic. Compared against refrigerants it is relatively benign but still a no-no. The sea outgases a large amount, but it’s on the Montreal/UNEP’s long list of bad chemicals (even though man-made M-Br is miniscule compared to natural). REPLY: do you have any references to Methyl Bromide being produced naturally by the oceans? This notion that the ozone hole is driving higher pressure gradients, leading to greater wind chilling, continues to bother me. Is drier air (the air itself) more or less sensitive to wind-borne cooling effects? If water vapor levels are much lower in the Austreal environment than previously modeled, then could another model outcome be differential chilling/warming difference due to wind? Drier air *cools* surfaces through evaporation, no doubt. But as I understand it, evaporative cooling wouldn’t happen in the Antarctic interior during the winter (or any other time, I suppose), so the remaining question would be what cooling effect wind speed has on cold air, relative to humidity. The mechanism isn’t clear to me. Milloy does a nice job of showing the cyclical nature of the Antarctic Ozone hole. Great post. I can never get a straight answer from anybody regarding if aerosols are increasing or decreasing in the NH. I brought this up on RC and no one answered my question. I’ll never be able to find the reference, but I recall that folks observed the ozone hole back in the 50’s, and again in the 70’s. As folks have noted, almost all the CFC’s were produced in the NH. The jet streams don’t allow much mixing of air between the hemispheres, so how did all those CFC’s make it south ? Aantarctica does have several active volcanos, which spew substantial amounts of SO2. Maybe not as bad as CFC’s, but far more local. With apologies to Steven Milloy, junk science at it’s best. The science appears to have shifted to & fro on this. I do seem to recall some discussions on one scientific panel. As of 1999 levels, manufactured (fumigant & gasoline) sources of M-Br about 30% of the total, the other 70% being natural processes (biomass burning, rapeseed, rice paddies, salt marshes & oceans). The oceans outgassed ~ 37 percent in 1999. Mfg’d fumigant levels are now below 1999 levels, I have no current data. What the various actual ozone-destroying components near the Antarctic? It’s a complex science, not much in the way of easily accessed information. I think there are other natural bromine sources, but M-Br is a big one. That was a lucky one: I serendipitously stumbled upon it, funny it being coincidentally related. And the climate picture … it just gets curiouser and curiouser. I read your posts in the RSS MSU thread. There is much not known. Some where we need to get back to basics. In a system as complex as the earth we must learn one variable at a time. It is time to reduce the number of assumptions and start to find out what is really happening. I used to trouble shoot on very large telephone PABX systems. They were complex but you had to break them down and perform test to determine what wasn’t working. Sometimes it took a while but in the end you found out what was causing the change in performance. I think that climate science has devolved in to a lot of computerized assumptions and not enough empirical data and field testing/research. I don’t know if anyone is reviewing raw data or if the raw data is available any longer for the past 130 years. I think there are to many adjustments to the data. I think adjusted data because it doesnt fit, or it is different from its near neighbors data, or the recording station is poorly sited or poorly maintained is a false reason. ( here in Alabama you can have a 15f difference in the range of 1/2 mile much less 1000km. We need to get back to basics. Good Scientific Method. The Tenana river near fairbanks Alaska “went out” on May 6th this year. This is the latest melting since 2002 (2002 and 2001 were a day later)….and as shown in the chart supplemented ot the article posted below, this is a very normal date for the thaw, looking back decades.. Bet on cooling? Only is someone other than James “The Magnifier” Hansen is in charge of the temp data…. Here is the original source of the graphic. It looks like the GISS had their fingers on it but they did not use their station data. The date range is from 1982 to 2004 so the extreme cooling which occurred in 2007 is not included. I need to find another source of satellite data for the region which will allow me to look at the most current information. There is some very interesting commentary in the last paragraph associated with the graphic. The first excuse is the now old copout that the Ozone Hole ate my Global Warming! The second excuse is an AGW heresy. Carbon Dioxide is a minor greenhouse gas except at the poles where water vapor has predicated out of the atmosphere. The primary assumption in the theory of climate forcing is that the North and South Poles heat from the inside out, not from the outside in. It just goes to show how much the Watermelons believe in their own BS. According to http://arctic.atmos.uiuc.edu/cryosphere/IMAGES/current.365.jpg, the 2008 Northern Sea Ice levels are now down to the 2007 levels. (There could be an interesting discussion on Leap Year impact, but I will skip that.) Looking at the images (cyrosphere’s pictures) of the two years’ ice levels, I cannot see how the jpg chart is consistent with pictures, but I will defer to the computer-generated graph instead of trusting my eyes; but I would like to know why my eyes are deceiving me! Here is my main curiosity: I have also compared current 2008 levels to the “record” in 1980. It seems that in 2008, we are now even with — or even ahead of — 1980 levels except in two places. One area is the Sea of Okhotsk, and I wonder about the impact of China’s black soot pollution there. The other area is the Barents Sea west of Novaya Semlya, and I wonder about the AMO impact of warm ocean currents there. I recall (from wind current charts) that E. Asian soot drifts across the Bering & over Alaska / Yukon / NW Terr. It’s also seeding No. Pacific wintertime super-convective T-storms 100’s of Km across, unprecedented, with westerlies bringing these onshore in NW USA. There are other sources of soot throughout the Arctic & Subarctic. Russian oil rigs in the Arctic & Siberia, for starters, but also shipping which uses tar-like crude that’s very sooty. As the Arctic corridors are opening up, shipping is exploiting it & dumping soot right on top of the fresh ice. But honestly, your guess is as good as any at the moment, but hopefully there’ll be some REAL FIELD DATA handy by end of summer. Christian Sci. Mon. ran an article last month about an int’l team currently surveying the aerosol sources & effects. It’s a hot topic but the media are largely ignoring it. I have a weak stomach so don’t visit RC often but I love the tough talk followed by “this bet ought to come with an escape clause”, i.e., a volcano or similar warmening calamity. Man up, please. I know you were joking, but all evidence shows that it was always there and always will be. There has been no net change since it was discovered in the 1950s. Did you see the study about GCRf & Polar heating? GFC creates stratospheric NOx that both causes ozone depletion & later aerosol heating in the lower troposphere. If this is true then we would see higher NOx flux during Polar winters That’d then cause sPiked Springtime heating. 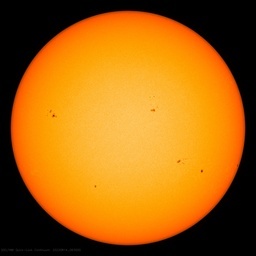 This could be ob-servable, right now, due to.to.thiS extended solar ninimum. The only real changes seem to be seasonal. Yeh, I figure you have a day job & have to wade through lots of comments. One other question. NPR did a bit about the Argo data not finding the warming anticipated by the climate models. I was thinking …. the 1998 el Nino burped out a pile of heat & then the next year temperatures dropped almost the same amount in response. Could that be where all that errant heat went? This makes me think. The warmist models might be half-right. Could it be that the el Nino / la Nina oscillations are gaining in amplitude. They’re modeling a more-stable system. Could that mean the warmists “natural variations” from Los Ninos are actually reflecting the system’s ability to shed the excess heat they can’t find right now? Another aspect could be the upwelling of warm water going into the Arctic. Most of the year Arctic insolation is weak, meaning that the now-open waters have more emissivity outbound than insolation inbound, a 2:1 ratio. The gist of this is that the oceans, being real big like they are, are functional heat exchange systems that can shed excess inbound heat from extra warming, making the time constant/heat latency shorter than modeled. This would explain why we have ice ages but not heat ages. The oceans tend toward a thermal constant and big El Ninos or Arctic thaws will regulate the backlog by shoving the heat back out into space. The Antarctic fringes would thaw in a likewise manner, dumping heat out in the fall and spring before solar heating takes over. This concept wouldn’t exculpate CO2 terribly well for those who’d like to otherwise, but that might explain the discrepancies that are inciting we skeptics and puzzling the warmists. I’m also wondering what effect aerosol dimming would have on the surface in the ability of the seas to off-load the heat due to reduced evaporation, and hence, reduced evaporative cooling. I think it’d reduce evaporation in high-aerosol regions but would get offloaded as increased rain clouds elsewhere where surface dimming wasn’t as prevalent (the southern hemisphere?). Eventually the heat piles up into a big el Nino like ’98. Makes me wonder if the 2000-2007 double set of PDO oscillations were unusual in any regard (amplitude, frequency). V. Ramanathan, et al, in 2008 noted that the net heating effect of tropospheric brown clouds over the Pacific alone was about 40 percent. That’d reflect a fair amount of surface dimming as well, I reckon (don’t have my handy dandy quick climatology/oceanography data facts almanac handy… :-). So the next question is whether that’d moderate direct surface heating since the brown clouds are actually net heat traps, or what that’d do for T-storm strength (although the N. Pacific is seeing unusually big winter T-storms from aerosol cloud seeding). So, watt would this mean? Could the next big release of heat show up early, with heat-burps piling out as aerosol shading increases. Bigger amplitude, both ways, since all that heat leaving the system in one big belch makes for big coolth afterwards, tending toward a self-regulating state. Is there any merit in this idea? What would the realclimate boys have to say about this? Thanks for those charts… dang, that’s some noisy data. Had to squint my eyes just to look at ’em. I’m thinking more in terms of 11-year solar cycles, where the solar inter-cycle transit minima would let in more cosmic rays. The result would be longer-period amplitude changes over time in the regular seasonal flux of the ozone hole. That is, the seasonal flux of the ozone hole during solar minima would be greater (bigger hole) since GCR -> NOx effects would be bigger. During solar maxima the ozone hole would be smaller. I do see in your charts (thank you) something of a 5-year period in seasonal flux during the 1960’s and 1970’s, that could match the max & min of the typical solar cycle. Dunno if an overlay of solar cycles would show anything. Can anyone give me dates on the last few warm/cool phases of the Antarctic Oscillation (a/k/a the Southern Annular mode), esp. prior to 1950? What would cause rain to fall when no visible clouds can be seen above or around you? It happened in NE Oregon last week after a big cold dust storm blew in from a county west of us with a snow covered mountain range in-between. Several people saw a rainbow too, again with no clouds. A blogger at the Atmoz website had castigated you for posting an outdated image of Antarctica. I submitted a response over there, but for some reason it did not get posted. If you visit the Earth Observatory website, you’ll notice the previous and updated image of Antarctica is respectively based on data provided by “Josefino Comiso, NASA-GSFC” and “Joey Comiso, GSFC” – likely one and the same person, and more than a “PR droid” (as suggested by the blogger). 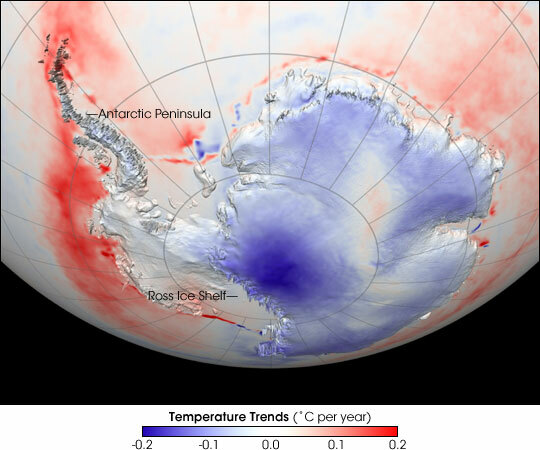 “Scientists from NASA’s Goddard Space Flight Center have been working for several years to create and refine a satellite map of long-term temperature change in Antarctica. This image illustrates long-term changes in yearly surface temperature in and around Antarctica between 1981 and 2007. (An earlier version of this map is pictured in a previous posting on the Earth Observatory.) Places where it warmed over time are red, places where it cooled are blue, and places where there was no change are white. Given the stark difference in the imagery (and likely the data upon which they are based) over such a short term, I asked Atmoz whether we are experiencing an ARGO type deja vù by changes in sensor technology. Since Atmoz was beginning to look at ground station data, I also suggested a thorough review particularly for the years 2005-2007. Will you post the foregoing? REPLY: Thanks for doing that, Atmoz’s new mission in life is findign ways to minimize what I have to say, so I’m not surprised. He failed to read the image caption though, or maybe he did but just didn’t care. Never mind about my cloudless question. The net has some explanations that appear to explain it well. It happened again today and I noticed that the counties west of us had high wind warnings again, so there is a lot of dust in the area combined with ice crystals in the upper atmosphere. It was also snowing in a 5000 ft mountain pass. I recommend a sacrifice to the Volcano God, in keeping with the cultish attitude of the Warmenistas.